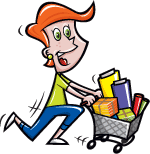 With this item you will earn 162.57 Points in Homespun Rewards! 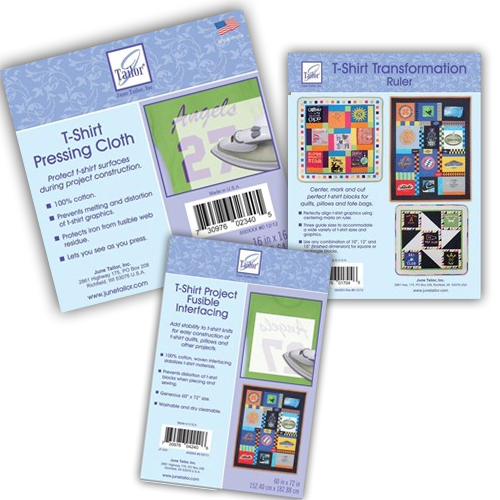 This Combo pack includes the 3 tools to help you make your special memory T-shirt quilt. 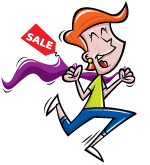 Plus - a 10% savings on the combo! 1. JUNE TAILOR-T Shirt Transformation Ruler. Center; mark and cut perfect t-shirt blocks for quilts; pillows and tote bags. It has three guides sizes to accommodate a wide variety of t-shirt sizes and graphics. 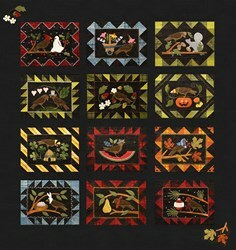 Use any combination of 10; 12 and 15 inch for square or rectangle blocks. The ruler measures 15-1/2" 15x1/2"
2. 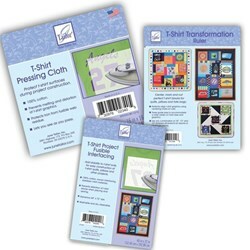 Add stability to t-shirt knits for easy construction of t-shirts quilts, pillows and other projects. • 100% cotton, woven interfacing stabilizes t-shirt material. • Prevents distortion of t-shirts when piecing and sewing. • Generous 60" x 72" size. • Washable and dry cleanable. 3. T-Shirt Pressing Cloth. This cloth will protect t-shirt surfaces while you are working on the project. It prevents melting and distortion of graphics, and protects iron from fusible web residue. The cloth is 100% cotton. This package contains one 16x16 inch pressing cloth. Made in USA.